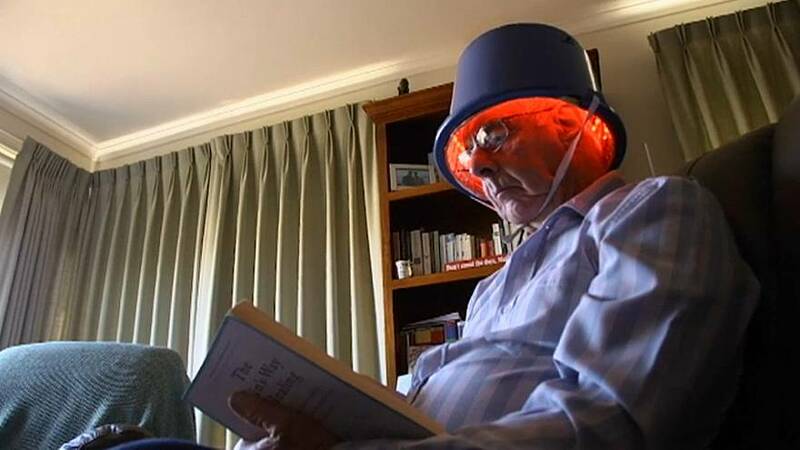 A group of Tasmanians living with Parkinson's disease claim wearing red and near-infrared light helmets twice a day is slowing the progression of their symptoms and improving their quality of life. They've inspired a clinical trial that's now underway across Australia to confirm if the lights are actually making a difference, or if it's just a placebo effect. Retired physician Dr Catherine Hamilton developed the infrared light helmets after she began using red lights in 2016 to improve her own arthritic knee. While there isn't any definitive science on the treatment, she believes red and near-infrared lights can regenerate old cells and help create new ones. She explained: "They're able to penetrate a cell and then pop a little pulse of light energy into the cell battery, called the mitochondria. "And the cell battery, if it's been unhappy, because the cell isn't functioning well, the cell battery will go, oh, thank you, I like that, and start promoting some activity of the cells." Former Australian federal politician Max Burr has Parkinson's disease. He says he was the first Australian to test the lights on his head. "I could literally have fried my brains, I didn't know," he said. "But I was prepared to take the risk because there was no other form of treatment that could offer any improvement to the condition." Burr has been using the lights for 20 minutes, twice-a-day for the past three years. He claims his shaking has calmed down enough to allow him to play the piano again, and says most of his other Parkinson's symptoms have subsided. Grace Winiecki, 63, who also has the disease, says she has seen similar improvements. "I'm much happier, feel a lot lighter, shake less, laugh more." However, it is yet to be scientifically proven whether the helmets are making a difference. A team of researchers in Sydney are now conducting the first clinical trial into their effectiveness. Dr Ann Liebert and her team are running the trial involving Parkinson's and non-Parkinson's patients in Sydney, Brisbane and South Australia. "The main hope is that we can capture and replicate what the clinical observations have been over the last few years in Tasmania, in other centres around Australia," said Dr Liebert. "And that we can characterise and predict who would be able to benefit from the helmets if it's a sustained improvement." The first results of the trial are expected later this year. Whatever they are, Dr Hamilton says she'll keep making the light devices.